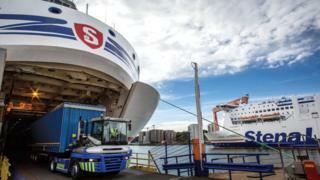 A no-deal Brexit could affect food supplies and see traders bypass Great Britain, the ferry firm Stena Line has warned. There is "very little readiness" at ports and "anxiety is high", said Ian Hampton senior executive at the global ferry operator. Stena is the largest ferry operator in the Irish sea and owns three UK ports. The government said it had proposed an ambitious future relationship with the EU to keep trade flowing. Mr Hampton said there was a possibility Stena Line would reduce services to and from the UK as a result of Brexit. "We can't plan on the basis of what we don't know, so we're very anxious about the outcome," he told BBC Radio 4's Today Programme. He warned traders could stop using Great Britain to get from Ireland and Northern Ireland to the rest of the EU, and instead sail direct to the continent. A no-deal Brexit that created friction on the Northern Ireland border, or delays if extra checks were put in place between Great Britain and Northern Ireland to implement what's become known as a Brexit backstop, could have a significant impact on trade flows, he said. Asked if added friction at borders could result in fewer Stena Line sailings to and from UK ports, he said that while the firm did not want to move routes "this could be one of the implications". He called for clarity from the government about what trade declarations would be necessary in the event of a no-deal Brexit. Without it, he said, delays at ports could affect whether food got to supermarket shelves on time. Mr Hampton, chief people and communications officer at Stena Line, was also worried about whether a new computer system to handle customs declarations - known as CDS - or its predecessor, could cope with a sharp increase in volumes following a no-deal Brexit. "We're concerned about that," he said. "I'm not sure it can. This is a system that was not written for the purpose we're now asking of it and I think that would [create] huge concerns." Watch: How could Brexit affect trade with Ireland? Stena operates three UK ports, Holyhead, Fishguard and Cairnryan, and carries more than seven million passengers and two million units of freight to and from the UK each year. A government spokesman said it was engaging with ports, and senior officials had visited those owned by Stena Line. "It is crucial to keep trade flowing when we leave the EU," the spokesman said. "That is why we are proposing a pragmatic and ambitious future economic relationship with the EU, and we remain committed to reaching agreement on the Withdrawal Agreement and future framework this autumn." Video Reality Check: How could Brexit affect trade with Ireland?